We are still experiencing some warm fall days reminding us that winter is not quite here yet. 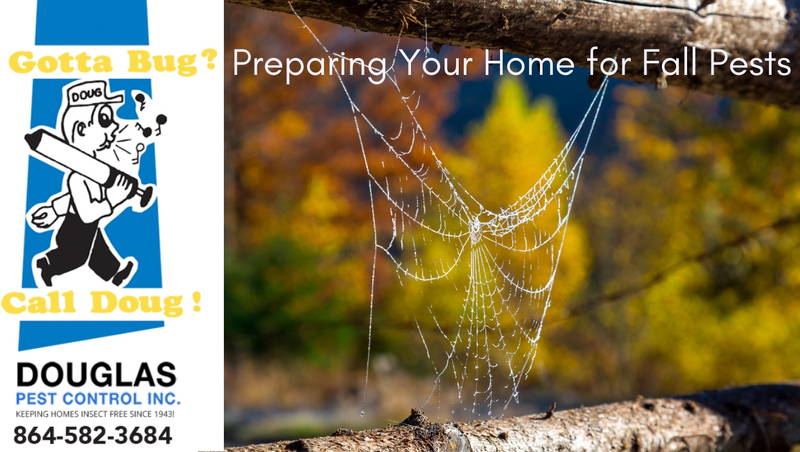 Take advantage of the warm days and prepare your home for fall pests. Some pests may have already started building their homes for winter during the summer time. By taking a moment to look around for any nests that may have started taking shape can help prevent any pests living with you this season. Spiders prefer to build their webbed homes in piles of wood. While stinging pests will typically stay closer to your home, finding a cozy spot underneath eaves. Do you have leaves starting to pile up? Any firewood leaning against your house waiting to be used? While that may seem convenient it is putting you at a greater risk to invite pests into your home. Many types of insects like to hide in the vegetation closest to your home, so they can sneak inside. Mosquitoes, rodents, spiders, and many more like to make a home inside branches and vegetation. By taking the time to move wood, branches, and grass further away from your home you are limiting the exposure you have to these pests coming inside. It is important to check for openings in your homes structure. Any buildings on your property including garages and sheds could become a wildlifes new home. Insects have a way of sneaking in, so it is important to look for loose siding, holes, and loose roofing. No matter the size of the hole it is important to fix. Rodents like rats and mice can squeeze through an opening the size of a pencil. Cleaning the yard up can help eliminate unwanted pests and insects. If you have items like old lawn mowers or bikes laying in your yard these can be an attraction for pests. Spiders love areas they can build webs in. As well as wasps and bees could set up their nests in it. No matter what level of unwanted pests you have, they are no fun to get rid of. So if you Gotta Bug Call Doug! Douglas Pest Control would love to help you eliminate any pests you may have in your home.